VIOLET GREY is a small, close knit beauty company whose entire raison d’être revolves around rigorous testing to find the best solutions for any beauty concern (shoutout to the #VioletCode). Accordingly, this very curious thing happens at our office by which we all unconsciously develop an inventory of our colleagues’s physical flaws—but in an honest-to-god completely neutral and non-judgemental way. It goes like this: New acne products to test? Those should go to so-and-so, who’s been breaking out lately. Hair care that claims to neutralize brassiness? Blah-blah-blah is looking pretty orange—ask him/her to try it. 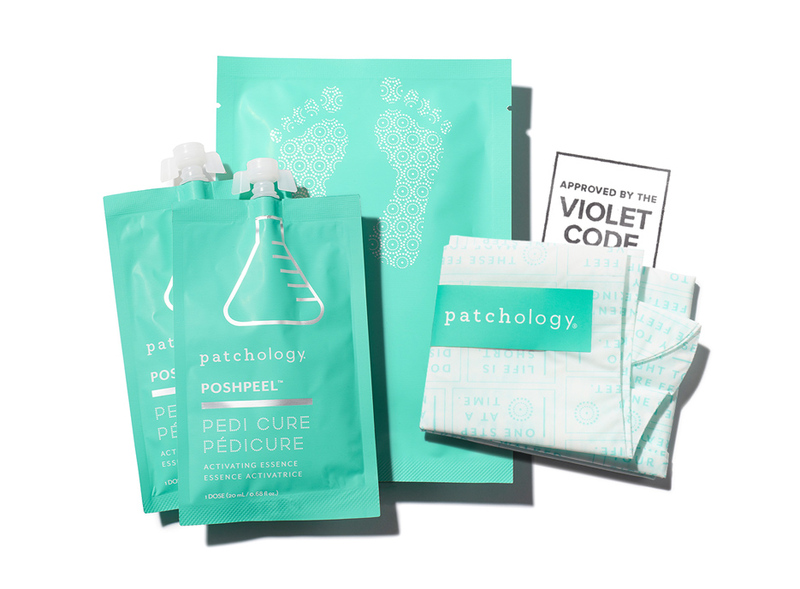 Well, I’m proud-slash-ashamed to admit that I was the unanimous nominee to test Patchology’s PoshPeel Pedi Cure, one of the stars of our brand-new nail, hand, and foot care edit. To be blunt, my feet were fucked up—and I had no one to blame but myself. I’m incredibly lazy about maintenance, wear only flip-flops or four-inch pumps, and have danced for years (which is basically the podiatric equivalent of smoking cigarettes). At any given time, at least 20 percent of my toenails were held in place with band-aids. In short, my feet were blistered, callused, dried-out messes—and widely regarded as such, apparently. Enter the Patchology PoshPeel Pedi Cure, which the product’s packaging obliquely terms a “treatment.” What it should say, however, is “religious experience.” Because Patchology showed me the light and absolved me of past sins; my feet have been born again. And I mean that almost literally, since all of the skin under my ankles now feels like it belongs to an infant. Discover and shop Patchology PoshPeel now.